This set comes with both Smoked Porter and Tropical Shandy blends, so everyone’s tastes are treated right. When hot sauce met beer, the angels began to sing… and by the time they looked at the clock, it was well past midnight. Few combinations can claim that kind of flavor party power, and this hot sauce set pays tribute to it. It comes with both Smoked Porter and Tropical Shandy blends, so everyone's tastes are treated right. 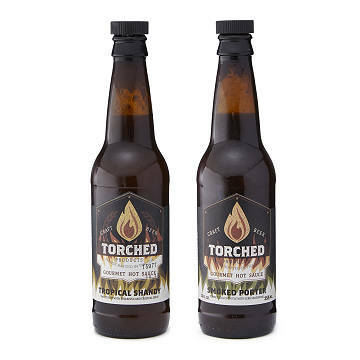 Packaged in repurposed beer bottles, it's a fun gift for the host who loves a little heat with their hops. Made in Florida.